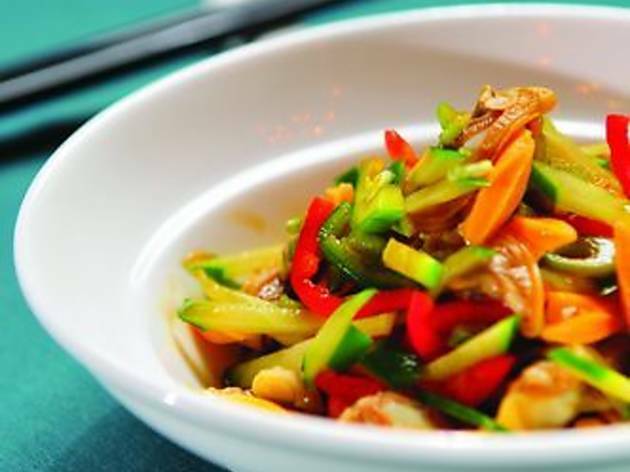 All of the elements of contemporary Chinese cuisine come into play at Ren Bai. The curiosity is first tickled by a red door hidden in an alley adjacent to the Mid-Levels escalator. Beyond this barrier, a small tree-shaded patio with deck chairs seats guests awaiting a table, and smokers on a mid-meal break. At night the space is lit by candles, and though you can still hear the commuter rush travelling home on the escalator adjacent to the restaurant, this little alcove is a hidden piece of privacy. This reflects our sentiment for our entire experience at Ren Bai – a reclusive escape from the crowds of Soho while still being in the middle of everything. Once actually inside the restaurant, guests encounter a high-ceilinged, no-windows Shanghai-style social club – think of it as a humble version of the China Club. A series of cigarette girl sketches adorn the walls, helping to break up or perpetuate the masculine feel of the furnishings (we can’t figure out which emotion they are trying to play up more). A collection of Shanghainese operettas and French songbirds play on the stereo, complementing the nostalgic 1940’s décor. 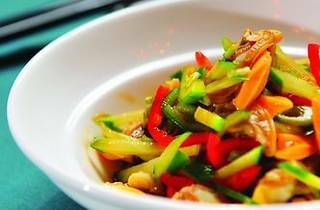 While the décor maybe Shanghai-centric, their menu mixes the northern cuisines of Sichuan and Beijing dishes freely. Our first order was a small starter of poached clams in mustard sauce ($68). Warning, prepare yourself for a wasabi shot up the nose – plucked from their shells, these little clams were almost too hot to taste the subtle shellfish flavour or the mixed chopped vegetables that surrounded the dish. But it was a fantastically curious start to the meal. Next, a large bowl of poached beef in Sichuan chilli arrived ($128), so spicy our Korean dining companion couldn’t even handle the heat. Saturated in the sauce made of a thousand Sichuan chillis and peppercorns, the beef, bean sprouts and noodles were so far beyond hotness that we instead experienced a minty coolness on the tongue. Next up was an order of fried string beans with preserved olives and minced pork ($88), which could be seen on every table in the small dining room – a fantastical mix of salt and grease that made for a tasty, savoury dish. The green beans were wonderfully blistered, as they should be in this dish, so don’t believe it is overcooked, this is an intentional effect. Lastly, a bowl of beef and pumpkin in black bean sauce ($98) arrived. Steaming with the most wonderful aroma, the sweet pumpkin was a great contrast with the salty black beans, while the beef was tender and lovely. The portions might look a bit on the small side, but they are very shareable and filling, although overall, the meal was a bit pricey considering the cuisine is essentially Chinese comfort food. But factor in the delightful atmosphere, bi-lingual staff, and location, we were happy to pay a little extra for a stir of our senses. 59 Caine Rd, Soho, 2523 2872. Daily noon-11pm. Meal for two: around $550.